NASA’s Hubble Space Telescope has captured the tiny moon Phobos during its orbital trek around Mars. Because the moon is so small, it appears star-like in the Hubble pictures. The little moon completes an orbit in just 7 hours and 39 minutes, which is faster than Mars rotates. Rising in the Martian west, it runs three laps around the Red Planet in the course of one Martian day, which is about 24 hours and 40 minutes. It is the only natural satellite in the solar system that circles its planet in a time shorter than the parent planet’s day. About two weeks after the Apollo 11 manned lunar landing on July 20, 1969, NASA’s Mariner 7 flew by the Red Planet and took the first crude close-up snapshot of Phobos. On July 20, 1976 NASA’s Viking 1 lander touched down on the Martian surface. A year later, its parent craft, the Viking 1 orbiter, took the first detailed photograph of Phobos, revealing a gaping crater from an impact that nearly shattered the moon. From the surface of Mars, Phobos can be seen eclipsing the sun. However, it is so tiny that it doesn’t completely cover our host star. Transits of Phobos across the sun have been photographed by several Mars-faring spacecraft. 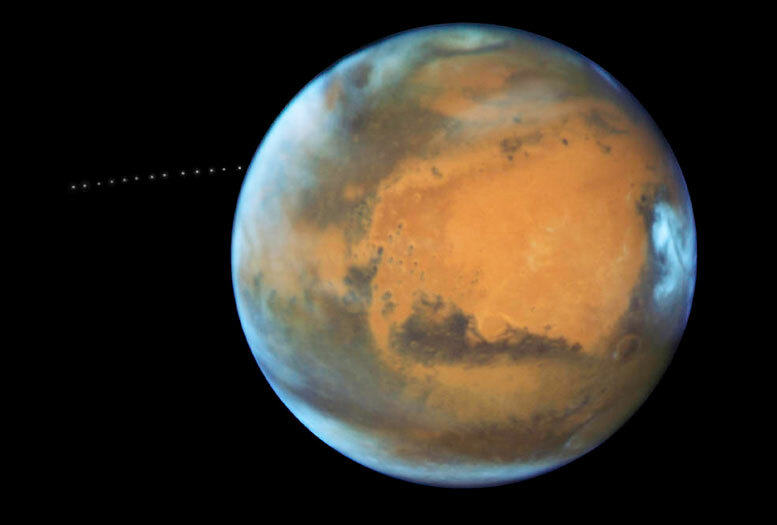 Be the first to comment on "Hubble Views Tiny Moon Phobos Orbiting the Red Planet"